As a longtime reader of tarot cards I am the proud owner of many decks of cards: tarot cards, oracle decks (fortune telling cards that are not tarot), playing cards, and card games. 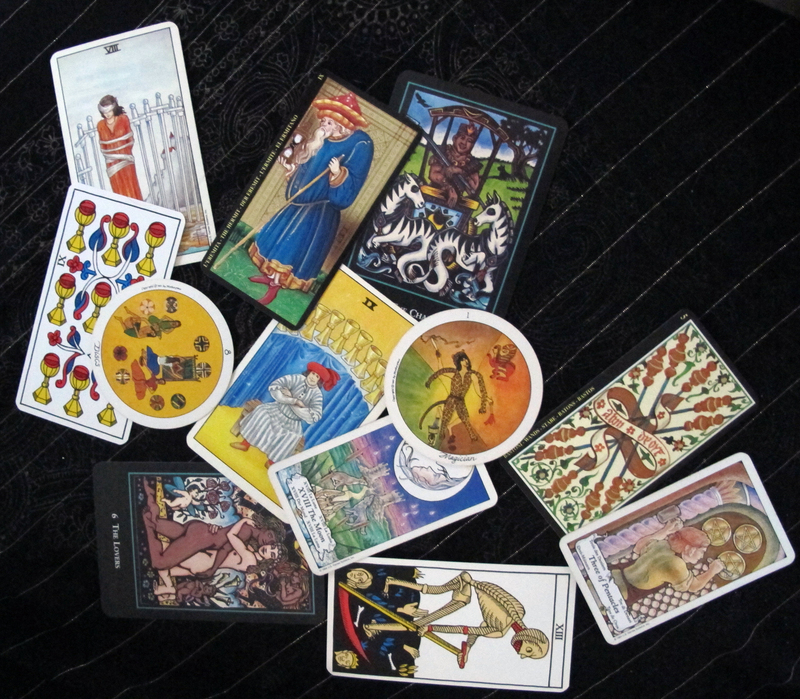 This post is about my favorite tarot decks and is confined to the decks I actually own and use for readings. I am a collector, so I have many decks I enjoy looking at but don’t generally use for readings. I am not a big fan of decks that are not fully illustrated; that is decks in which the numbered cards or pips do not have an actual depicted image of the author’s idea of the meaning of the card. Instead they have four pentacles or seven swords on them, much in the manner that the three of hearts is symbolized in the typical playing deck, though in the case of these tarot decks, usually more ornately. Some of the decks which are not fully illustrated have historical significance, such as the the Visconti-Sforza Tarot, Tarot of Marseilles, or the IJJ Swiss Deck. These are good additions to any collection, but they are not that evocative to me for readings. I have been extremely disappointed in the past when I’ve bought a deck based on attractive packaging or a whim only to find that the Minor Arcana were not fully illustrated. The two decks that I use most often are the great standby, the Rider-Waite deck, and the Mary Hanson Roberts Deck. The Rider Waite deck originally published in December 1909, is the defining deck of the English language world. It is the deck to which all subsequent decks are compared. It is the brain child of Arthur Edward Waite and was beautifully illustrated by Pamela Coleman Smith, both of whom were members of the Order of the Golden Dawn. Several years ago in 1990, Mary Hanson Roberts was the artist that did a recoloring of the Rider-Waite deck which is sold under the name the Universal Waite Tarot. Her own deck, The Hanson Roberts Tarot has imagery based on Rider-Waite and is not at all frightening to the person being read. Almost all the images are very friendly and will put the querant at ease. I also really like a newer deck called the World Spirit Tarot by Lauren O’Leary and Jesica Godino . It was put out in 2001 but it is not currently in print. The illustrations are from linoleum block prints and very attractive and evocative. The Motherpeace Round Tarot by Vicki Noble and Karen Vogel is excellent to have on hand, and now that it is available in a smaller size, it is easier to manipulate the cards. It is a woman’s deck celebrating different cultures and ideas of community. A couple of months ago I chanced upon a deck called the Guardians of Wisdom by Emy Ledbetter and Todd Hershey which is amazing for the insights it provides. It is literally a tarot deck but I use it for short questions mostly for myself and it has not disappointed. I have not used it for a Celtic Cross reading for fear it would provide too much information to digest all at once. The minor arcana use the suits of regular playing cards but are fully illustrated. Sadly it is out of print at the current moment. Worth noting is that Motherpeace, Guardians of Wisdom and World Spirit are multicultural, multiracial decks, while the others are primarily Eurocentric. This is by no means a comprehensive review. There are lots of terrific decks out there. I have lots of other beautiful decks that I really love. A place where I often go to look at tarot decks on the web is the Tarot Garden. The site is filled with information on hundreds of decks including their availability and whether they are fully illustrated or not. In trends of the holiday party world, I have noticed in my own work that though tarot card reading remains my most popular offering, handwriting analysis is edging out palmistry by a wide margin. I think this is because handwriting analysis can be successful even in a very loud party environment, where hearing what is being said can be daunting. The actual analysis can be a nice take-away party reminder. Though it was not my initial intention to create this blog to be about entertaining, that is in fact what my life is about this time of year. I enjoy the good fortune to bring people the opportunity to explore ideas about the paranormal in a friendly, non-threatening, and celebratory environment. If I bring an “Ah-ha” moment to an event attendee I am thrilled to have participated in opening a portal for them which they can further explore. 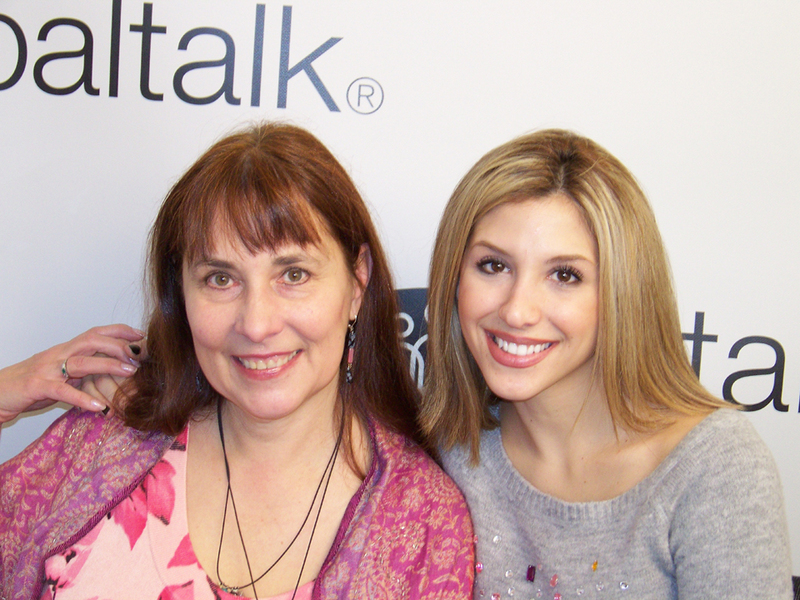 On Thursday, December 6th, I was a guest on the Diana Falzone Show live on Paltalk.com. We had a lot of fun talking about psychic subjects both on and off camera. Through the magic of the internet we spoke to Paltalk members live. I read tarot cards for the callers to answer their questions. Diana is a terrific host, a multitalented performer, and a very personable and attractive young woman. Thanks to both Tanya Meunier and Gary Baumgarten for making it all possible. The photo is by Gary Baumgarten.